Following the rising trend in the usages of smart mobile devices, recruitment process has also gone mobile. 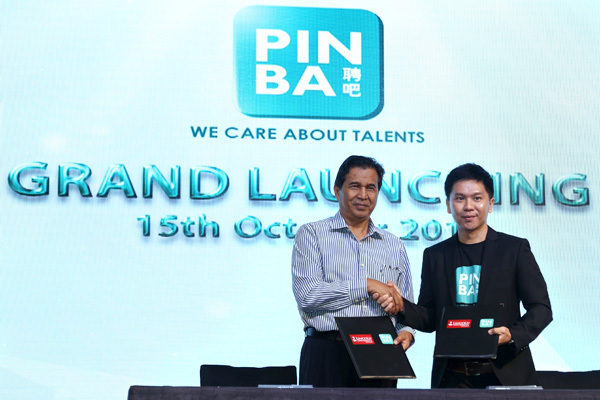 Introducing the latest mobile recruitment platform — PINBA, an innovative mobile app connecting talents and employers, that is officially launched in Malaysia today. Through PINBA, the recruitment process flow will be simplified. 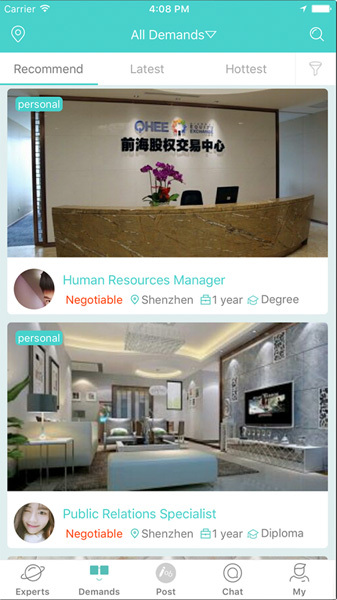 Users can easily obtain the latest recruitment information through the app, and directly apply for the vacancy through their personal accounts. Other than allowing users to rate and leave comment, PINBA’s smart system will also customized your job search results based on your personal requests, making it less time consuming and more effective for both talents and employers. PINBA’s two main objectives are “to help individuals showcase their capabilities to attract employment” and “to assist partnering organizations in recruiting suitable talents”. The app does not only allow job seekers to view various opportunities anytime anywhere, but also focuses in searching, recruiting and discovering quality talents from all over the world. The unique feature of PINBA mobile app also includes uploading personal resumes, directly connecting employers and talents, job/talent search through maps, audio/video presentation functions, system automated job match, instant messaging and personality smart match. Users (jobseekers) can upload their complete personal resumes into the PINBA’s personal resume management system. The system allows user to make changes, update, search for jobs, check their application history and obtain job search analysis online. The functions of the system will efficiently deliver the job seekers’ application messages to the various companies, assisting employers to complete their recruitment processes in the most efficient way. Working location is often the top priority of most job seekers. PINBA introduces the “Job Search Through Maps” function that helps job seekers identify job opportunities within the vicinity, making it efficient and convenient. For example, when companies or organizations needed part-timers, they can easily search for job seekers within the 5km radius of their company or function locations. At the same time, job seekers can also view and select job opportunities near to their homes. PINBA includes a real-time audio presentation function allowing job seekers to record their “audio resume” and share it out to potential employers. This function is especially useful for those seeking for emcee, vocalist or audio-related positions. Service industries such as media companies and advertisement firms can also review the basic information and vocal qualities of the applicants prior to contacting them. PINBA features the asynchronous video interview. Talents can record a 10 to 15 sec video to introduce themselves, allowing the interviewers to have a better understanding of their personalities and abilities beyond their written resume. This might help interviewers identify the best candidates with less time and effort. To meet the different needs of industries and job search, PINBA’s system will automatically update job seekers various recruitment notices based on information provided by users. Once a vacancy which matches with your professional skills is available, the “system automated job match” function will be activated, matching talents with the vacancy instantly. Through this personalized screening process, organization will be able to find suitable candidates faster and easier. Through the messaging functions, talents can connect directly with the hiring companies, and even conduct phone or online interviews. No more worries of missing resumes, and both parties can clearly discuss about details like job scopes and company benefits. The fundamental of finding an ideal job is to first understand your own capabilities, personality, language and interest. PINBA helps organizations to collect and feedback all these related information, allowing them to better analyse candidates apart from the usual education and working experiences. In the pipeline, PINBA will also be launched in 10 countries within Asia region where the total population of these countries are close to 2 billion over the next 36 months. Once reached a conservative estimation of targeted 5 million active users by then (out of total population of 2 billion), PINBA is bringing their company to be listed in the NASDAQ to raise more funds to open up market in the west. As per valuation analysis conducted by Financial Ventures Group (FVG), a renowned New York based advisory firm, PINBA will be targeting a market valuation of USD1.2 billion based on the said 5 millions active users. For more information, please visit PINBA’s website at www.pinba.com.my or facebook page at www.facebook.com/Pinba4u.